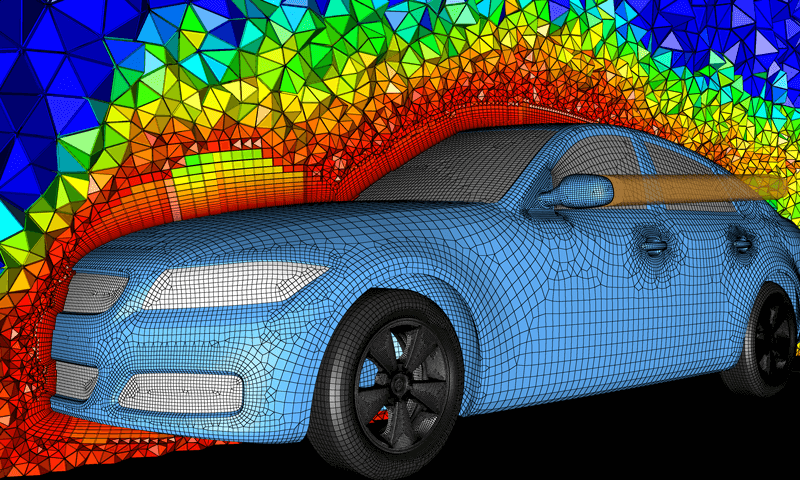 Pointwise V18 is now available for download and production use. This is a major new release that greatly expands the software’s core meshing functionality as described below. Figure 1: A hybrid mesh for the DrivAer benchmark geometry illustrating quad-dominant surface meshing (blue), unstructured hexahedral layers (colors), and a tetrahedral cell clustering source (behind the side mirror). Quad-dominant surface meshes can now be generated. This new technique is a highly automated method for generating unstructured meshes consisting primarily of quadrilaterals with relatively few triangles. T-Rex (anisotropic tetrahedral extrusion) has been extended to allow quad-dominant surface meshes to be used as the initial extrusion front for the generation of unstructured hexahedral layers. Surface meshes (domains) and volume meshes (blocks) can now be retained, created, modified and examined in “mixed cell” format – a mixture of quadrilaterals and triangles for domains, a mix of hexahedra, tetrahedra, prisms, and pyramids for blocks. Tetrahedral mesh cell sizes can now be controlled with geometry-based clustering sources. A more complete list of new features in Pointwise V18 is available at www.pointwise.com/pointwise. To download and begin using Pointwise V18, go to the downloads page on our website, www.pointwise.com/downloads, or click the button below. IMPORTANT: Pointwise V18 uses a different license manager (Reprise License Manager, RLM) than previous versions. You will need to do a complete install and request a new license.